"It should be clear that cartilage does not yield its secrets easily and that inducing cartilage to heal is not simple. The tissue is difficult to work with, injuries to joint surface, whether traumatic or degenerative, are unforgiving, and the progression to osteoarthritis is sometimes so slow that we delude ourselves into thinking we are doing better than we are. It is important, however, to keep trying." Dr Henry Mankin, Boston, Massachusetts, USA. Articular cartilage is a highly organized avascular tissue composed of chondrocytes embedded within an extracellular matrix of collagens, proteoglycans and noncollagenous proteins. Its primary function is to enable the smooth articulation of joint surfaces, and to cushion compressive, tensile and shearing forces. Hyaline cartilage has one of the lowest coefficients of friction known for any surface to surface contact. Hyaline articular cartilage provides the bearing surface of synovial joints. Cartilage is unique as it is an avascular, aneural tissue, in which cells survive for a lifetime, without intercellular connections. In particular, adult articular cartilage has no other known function than maintaining mechanical competence and smooth articulation. Owing to its sophisticated composition, its high water content and its ability to withstand hydrostatic pressurization, cartilage is capable of transferring enormous forces relatively evenly from one subchondral bone plate to the other. Under physiological conditions, cartilage also provides an almost frictionless gliding surface and is thus capable of transferring these loads during motion. In order to be able to meet these complex mechanical demands without undergoing wear and tear, articular cartilage displays unique morphological and biomechanical properties. These properties are yet unmatched by any artificial material, despite considerable efforts by engineers and biologists. Although hyaline articular cartilage appears to display atrophic changes (thinning) during unloading and may exhibit compositional changes (increase in GAG) after exercise, it seems to differ from other musculoskeletal tissues with load-bearing function as it cannot increase tissue mass postnatally as a result of mechanical stimulation. Source: Eckstein Felix, et al. The effects of exercise on human articular cartilage. J. Anat (2006) 208: 491–512. Articular cartilage repair is still focused on repairing hyaline articular cartilage which is a complex structure but only a part of even more complex osteochondral unit, which includes calcified cartilage, subchondral bone plate and subchondral trabecular bone. Better understanding of the morphology and biology of subchondral bone and the entire unit, and more three-dimensional approach to the repair of the whole unit, rather than the articulating surface only, is necessary to improve on the quality and the durability of articular cartilage repair. Terminology: the term “subchondral bone” is very ambiguous and morphologically inaccurate. The term ‘‘subchondral bone plate’’ or ‘‘subchondral zone’’ is correctly used to refer to cortical endplate lying immediately deep to the calcified zone of the articular cartilage. 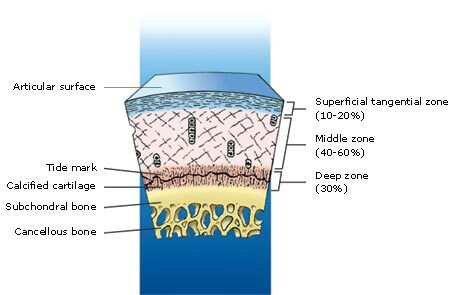 The line separating the calcified zone from the subchondral bone plate is called the ‘‘cement line.” The subarticular “spongiosa” (trabecular bone) and the subchondral bone plate form the subchondral bone. A surprisingly high number of arterial and venous vessels, as well as nerves, can be seen in the subchondral region sending tiny branches into the calcified cartilage. 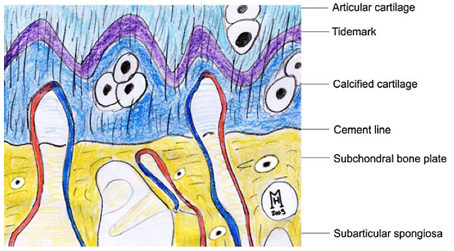 The tidemark is crossed by collagen fibrils extending from the articular cartilage into the calcified cartilage, while no collagen fibrils connect the calcified cartilage to the subchondral bone plate. Blood vessels from the subchondral region can extend into the overlying calcified cartilage through canals in the subchondral bone plate. Therefore, nutrients can reach chondrocytes in the calcified zone via these perforations. Unsurprisingly, the perforations are grouped together in the regions of subchondral plate where the stress is greatest. Image: Henning Mandry, article no. 1 below. Redrawn from: Imhof H, Breitenseher M, Kainberger F, Rand T, Trattnig S. Importance of subchondral bone to articular cartilage in health and disease. Top Magn Reson Imaging, 1999;10:180–192. The junction of calcified articular cartilage with subchondral bone is a feature that is often ignored, but it is of great importance for ensuring and maintaining the integration of cartilage with bone. 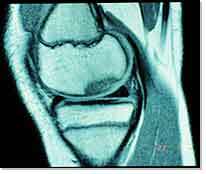 It is a site of active remodeling of bone and possibly of cartilage. At this site, there is substantial collagenase activity that causes the degradation of type-II collagen fibrils in articular cartilage and type-I collagen fibrils in bone. The importance of the active remodeling of this junction is poorly understood, but the process is indicative of a requirement for the turnover of collagen and presumably other matrix proteins, which maintains a healthy and strong interface between cartilage and bone. Overactivity of collagenases in these sites has led to the detachment of articular cartilage in experimental models of osteoarthritis. Source: A. Robin Poole. 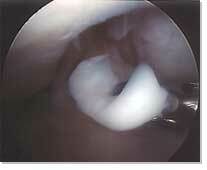 What Type of Cartilage Repair Are We Attempting to Attain? Scientific Article, The Journal of Bone & Joint Surgery. 2003; 85:40-44). The changes in the thickness of subchondral bone plate depend on the location and mechanical loads. Equally, the entire osteochondral unit, which is biologically and functionally inseparable, absorbs and distributes loads across the joint. We know from our MR imaging experience and numerous articles that subchondral bone responds to surgical repair of articular cartilage. Early subchondral changes (bone marrow oedema) seem to reflect increased metabolic activity and normal healing. Persistently abnormal marrow MRI signal usually indicates a problem with cartilage repair. Focally abnormal marrow signal often points to the site of repair tissue failure. 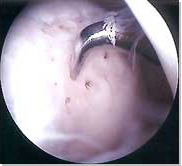 The appearance of subchondral cysts after cartilage repair is further indication of failed carrtilage repair as cysts represent a terminal failure (trabecular necrosis and collapse) of focal subchondral remodelling. Source: personal communication, Dr Carl Winalski, Cleveland, USA and Dr David Ritchie, Glasgow, UK). OsteoChondral Unit and Subchondral Activitity. Presented by Vladimir Bobic. Department of Orthopaedic Surgery Grand Rounds, University of Missouri, Columbia, Missouri, USA, October 2010. Henning Mandry, C Niek van Dijk, Magdalena Mueller-Gerbl. The basic science of subchondral bone. Knee Surg Sports Traumatol Arthrosc, 2010;18:419-433. Andreas H Gomoll et al. The subchondral bone in articular cartilage repair: current problems in the surgical management. Knee Surg Sports Traumatol Arthrosc, 2010;18:434-447. Lucy A Fawkes, Andoni P Toms. Bone Marrow Oedema of the Knee. The Knee, 2010;17:1-6. Why is articular cartilage repair necessary? Cartilage is frequently injured, often as a result of sports related trauma, but due to its avascular nature, articular cartilage has very limited capacity for repair. Injuries of the articular cartilage that do not penetrate the subchondral bone (partial thickness) do not heal and usually progress to the degeneration of the articular surface. Injuries that penetrate the subchondral bone undergo repair through the formation of fibrocartilage. Although fibrocartilage fills and covers the defect, this is the right tissue from the biomechanical standpoint. The fibrocartilage is made to resist tension forces, while the hyaline cartilage is made to resist compression forces, to enable smooth articulation, and to withstand long-term variable cyclic load and shearing forces. Focal articular cartilage defects, often found in young adults, have been increasingly recognized as a cause of pain and functional problems. There is more and more clinical evidence that full thickness articular cartilage defects continue to progress and deteriorate, although at a slow rate. Early diagnosis and treatment of these patients is recommended prior to the development of more advanced osteoarthritis. In selecting methods of restoring the damaged articular surface, it is important to distinguish articular cartilage repair from articular cartilage regeneration. Repair refers to the healing of injured tissues or replacement of lost tissues by cell proliferation and synthesis of new extracellular matrix. Unfortunately, repaired articular cartilage generally fails to replicate the structure, composition, and function of normal articular cartilage. Regeneration in this context refers to the formation of an entirely new articulating surface that essentially duplicates the original articular cartilage. Therefore, the best we can do at present is to repair chondral or osteochondral defects with functionally similar tissue. Historically there have been many attempts to develop clinically useful procedures to repair damaged articular cartilage. However, most cartilage repair techniques have not proved entirely successful yet. At present, the treatment options are still limited and the long-term outcome is still uncertain. The principal goals for surgical management of the symptomatic chondral and osteochondral defects are to reduce symptoms, improve joint congruence by restoring the joint surface with the best possible tissue, and to prevent additional cartilage deterioration. Although the need for surgical management is based on the patient's history, physical examination, and imaging studies, only knee arthroscopy will provide definitive information regarding the lesion's characteristics (ie, location, size and depth) and associated injuries (menisci and cruciate ligaments). Based upon their anticipated outcome, it is helpful to define treatment options as being palliative, reparative, or restorative. First-line treatment for smaller injuries in lower-demand patients with limited symptoms can be treated effectively with palliative procedures such as Debridement and lavage. Relief, however, may be incomplete and short-lived. Mid-sized lesions in patients with moderate symptoms can be treated with a reparative procedure using a Marrow-stimulating technique (Microfracture) in an effort to promote a fibrocartilage healing response. Results in larger lesions in higher-demand patients, however, are generally less favorable and shorter-lived, independent of any prior treatments rendered. Larger defects, especially in higher-demand patients with significant symptoms who have failed less aggressive primary treatment options, are most effectively treated with a restorative treatment option such as Osteochondral Autologous Graft Transplantation (OATS) and Autologous Chondrocyte Implantation (ACI). 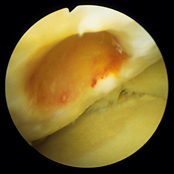 Lavage (arthroscopic washout) is one of the most basic of traditional arthroscopic techniques. Dr Robert Jackson, the pioneer of arthroscopy in North America, observed that in the course of performing diagnostic arthroscopies patients with intra-articular knee problems had significant pain relief following joint lavage. Exactly how arthroscopic lavage and debridement may help the early symptoms of osteoarthritis is still not entirely clear. Joint lavage removes loose intra-articular tissue debris and inflammatory mediators known to be generated by the synovial lining. In early stages, removing these degradative enzymes from the joint may allow chondrocyes to increase their biosynthetic activity. Another mechanism by which lavage may relieve the symptoms and increase the resiliency and stiffness of articular cartilage is through changing the ionic environment within the synovial fluid. Lavage may provide some patients with advanced degenerative disease of the knee, which may last as long as 3 years. However, the lavage provides only short-term symptomatic relief without correction of underlying pathology. If predisposing malalignment is not corrected, the beneficial effects seem to be limited. The outcome of this simple procedure is generally insufficient for the active population, and benefits are short-lived. Although very attractive as an option, the use of classic electrothermal chondroplasty devices may cause significant thermal damage to articulating surfaces and unacceptable level of irreversible chondrocyte injury. However, new devices are based on low-temperature bipolar radiofrequency technology which keeps operating temperatures below 50 degrees C and which are particularly suitable for use on Grade II and III chondromalacia. Grade II lesions are characterized by loose or fibrillated cartilage. For these lesions, the goal of the surgery is to remove the unstable, superficial layer and contour the cartilage surface. Grade III lesions are partial thickness lesions characterized by fissuring, unstable borders, and disruption of underlying chondral architecture. For these lesions, the goal of the surgery is to stabilize the edges of the lesion. This is accomplished by removing tissue layer by layer until a stable cartilage rim is reached, thus preserving the maximum amount of healthy tissue. Compared with classical mechanical debridement, bipolar radiofrequency currently appears to be the superior method for achieving good midterm results. Spahn G et al: Four-Year Results From a Randomized Controlled Study of Knee Chondroplasty With Concomitant Medial Meniscectomy: Mechanical Debridement Versus Radiofrequency Chondroplasty. Arthroscopy, Pages S73-S80, September 2010. This technique was developed and popularised by Dr Richard Stedman, from Vail, Colorado, USA. The treatment involves a disruption of subchondral bone in an attempt to induce bleeding (fibrin clot formation) and to initiate primitive stem cell migration from the bone marrow into the cartilage defect site. These techniques utilise primitive stem cells, which are capable of differentiating into bone and cartilage under the influence of various biologic and mechanical intraarticular factors. The subchondral bone is penetrated in order to reach a zone of vascularisation, stimulating the formation of a fibrin clot containing pluripotential stem cells. This clot differentiates and remodels, resulting in a fibrocartilaginous repair tissue. Although fibrocartilage often appears to offer the patient significant pain relief, this tissue lacks several key structural components to perform the mechanical functions, as a wear-resistant and as a weight-bearing surface. The fibrocartilage repair tissue does not produce a proper compressive stiffness against applied mechanical load and thus is subjected to an excessive deformation under physiological loading. This in turn may cause a mechanical failure of the repaired tissue and eventually lead to a recurrence of degeneration of the repaired articulating surface. For more information on Microfracture please visit Dr Richard Steadman's website. Mithoefer K. et al. : High-Impact Athletics After Knee Articular Cartilage Repair. A Prospective Evaluation of the Microfracture Technique. The American Journal of Sports Medicine 34:1413-1418 (2006). The authors of this study conclude that microfracture is an effective first-line treatment to return young athletes with short symptomatic intervals and small articular cartilage lesions of the knee back to high-impact athletics. Asik M. et al. : The Microfracture Technique for the Treatment of Full-Thickness Articular Cartilage Lesions of the Knee: Midterm Results. 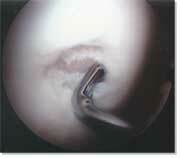 Arthroscopy, November 2008, 24; 11: 1214-1220. According to midterm results of this study, the microfracture technique is quite effective with regard to the improvement of daily activities with a favorable impact on pain relief and better functional results. Furthermore, the authors found that there was a correlation between functional results and age, size of defect, location of defect, and body mass index as prognostic parameters. This single-step technique was developed by Geistlich Surgery and uses the body’s own healing potential and the regenerative capacity of mesenchymal stem cells. It can be applied to full thickness cartilage defects that extend down to the subchondral bone and are bigger than 1 to 2 cm2. The AMIC technique is based on proven biological concepts first demonstrated by Dr Richard Steadman with his microfracture method. AMIC differs from microfracture in that a cover, in the form of the Chondro-Gide collagen matrix, is applied over the defect immediately following microfracture (the subchondral bone plate is penetrated using a sharp microfracture awl, approximately 4 to 5 mm apart). The Chondro-Gide matrix can be fixed with fibrin glue of sutures. This cover then traps the first few millilitres of bone marrow bleeding which contain the highest percentage of mesenchymal stem cells to form a so called ‘superclot’. In so doing the first and most important clot is kept in place and not lost into the joint which appears to happen with microfracture. The Chondro-Gide collagen matrix forms the roof of a ‘biological chamber’ and serves to protect and contain the stem cells as they differentiate into chondrocytes, which will form a healthy regenerative cartilage. This technique was developed simultaneously by Dr Laszlo Hangody in Hungary (MosaicPlasty) and Mr Vladimir Bobic in the UK (OATS) approximately 22 years ago. Osteochondral autograft transplantation seems to be the only surgical technique that can restore the height and the shape of articulating surface in focal osteochondral defects, with composite autologous material that contains all necessary ingredients: hyaline articular cartilage, intact tidemark and a firm bone carrier. However, like many other orthopaedic procedures that require the use of autologous tissues, osteochondral autograft transfer (or MosaicPlasty) is the "rob Peter to pay Paul" situation. The main problem with this reconstructive technique is the limited availability of autografts, which significantly reduces the choice of treatable defects down to a small focal chondral defect, and a long-term donor morbidity in multiple donor sites. Deep and large, crater-like osteochondral defects are not suitable for osteochondral autograft transplantation, mainly because of the limited availability of autologous osteochondral grafts. Also, it is difficult to reconstruct the subchondral bone and restore the contour of the defect area, and to cover the entire defect area with hyaline articular cartilage. The dead spaces between circular grafts, the lack of integration of donor and recipient hyaline cartilage, different orientation, thickness and mechanical properties of donor and recipient hyaline cartilage are further sources of clinical concern. The OATS Procedure. John Hopkins University, Baltimore, USA. Turtel A: Osteochondral Grafting of Articular Cartilage Injuries. eMedicine, March 18, 2005. Source: Good results seen at 17 years follow-up of more than 1,000 mosaicplasty cases. Gina Brockenbrough, Orthopaedics Today, 2009; 29:24. Long-term follow-up has shown mosaicplasty to be a successful option for treating full-thickness defects in the knee and other weight-bearing joints. “There were a lot of clinical evaluations of the mosaicplasty technique and many of them published a similar outcome — about a 90% success rate,” László Hangody, MD, PhD, said during his presentation at the 8th World Congress of the International Cartilage Repair Society. Hangody and colleagues, from the Uzsoki Hospital in Budapest, Hungary, in their follow-up of 1,178 mosaicplasties performed in different joints between 1992 and 2007, found good to excellent results with a low complication rate. A subset analysis of 849 femoral condylar cases with 10.3 years follow-up revealed a modified Hospital for Special Surgery (HSS) score of 92 points and a modified Cincinnati Knee Score (CKS) of 89 points. An 8.9 year follow-up of 36 tibial condylar cases showed an HSS score of 87 and a CKS score of 85. In addition, an analysis of 171 patellar and trochlear cases with 9.3 years follow-up showed an HSS score of 79, a CKS score of 72 and a Bandi score of 76%. Using the Bandi score, they also found a long-term donor site morbidity of 3%. Hangody and his colleagues have also found good results using mosaicplasty to treat high-level athletes. “At 10-years follow-up, 64% of our patients returned to the same level of sports activity,” Hangody said. “19% returned to a lower level of sports activity and only 17% were finished in their sports career.” He also noted that the procedure is indicated for patients with symptomatic focal chondral or osteochondral defects measuring between 1 cm2 and 4 cm2. Hangody L, Hangody LR, Módis L. Mosaicplasty: experimental background and 17 years clinical experiences with autologous osteochondral mosaicplasty. Paper #5.3. Presented at the 8th World Congress of the International Cartilage Repair Society. May 23-26, 2009. Miami. TruFit CB Plugs (Smith and Nephew, London, UK), are synthetic cylindrical biphasic absorbable scaffolds, based on PolyGraft Technology, designed to capture and retain bone marrow elements and encourage differentiation into articular cartilage and bone. Three-dimensional porous scaffold with interconnected pores (mean diameter of 250 μm) encourages tissue ingrowth and remodeling. This techinology is approved for use in UK. In the US this product is marketed by Smith & Nephew as TRUFIT BGS Plug, as Bone Graft Substitute for filling circular drill holes in bone, with the following disclaimer: "the safety and effectiveness of this device in osteochondral defects have not been established". This product is not intended for articular cartilage repair in the USA. The clinical, MRI and functional outcome studdies are very scarce. In 2009 Spalding and collaborators reported early UK clinical experience with 2 year results of articular cartilage repair in the knee using synthetic TruFit CB plugs (Smith and Nephew UK). 26 patients have undergone cartilage repair in the knee using TruFit CB Plugs. All patients have been prospecitively analysed collecting demographic, operative, clinical and MRI radiological outcome assessment. Data was collected at 12, 18 and 24 months post implantation. Protected weight bearing was advised for 4 weeks and sport avoided for 3 months. At 12 months the mean Tegner activity score improved from 2.4 to 6 (p =0.009). The mean Lysholm score improved from 48.3 to 71 (p = 0.008) and IKDC subjective scores improved from a mean of 37.7 to 65.1 (p = 0.004). KOOS outcome data showed statistically significant improvement in all domains with the mean KOOS sport and recreation score improving an average of 46 points (p<0.001). Within the SF-36 Health Outcome measures, the physical component score (PCS) improved from 39.5 to 50.3 (p = 0.018), and the mental component score (MCS) showed no significant differences, changing from 52.1 to 51.3 (p = 0.37). At 24 months all paramaters show a trend for further improvement but not statistically significant. MRI imaging on this series has shown reformation of the subchondral lamina and T2 Mapping has shown tissue values similar to normal surrounding cartilage by 9 months. The authors conclude that TruFit plugs offer an attractive solution to the management of full thickness chondral injuries enabling rapid mobilisation and return to sport. TruFit plugs provide a stable scaffold for early mobilisation of the knee post operatively, avoiding the prolonged period of limited weight bearing as follows microfracture, and the long recovery time following ACI. They believe that TruFit plugs appear to provide a simple one step solution in the management of small areas of chondral injury (<2cm diameter), particularly in patients who require rapid rehabilitation, and are keen to remain active at a high level. Riley J. Williams III and Gabriele G. Niederauer. Articular Cartilage Resurfacing Using Synthetic Resorbable Scaffolds. In: Riley J Williams III, Ed. Cartilage Repair Strategies. Humana Press, Totowa, New Jersey 2007. Tim Spalding et al. : TruFit Plugs for Articular Cartilage Repair in the Knee: 2 Year Experience, Results and MRI Appearances. Abstract. Arthroscopy 25 (6) Supplement, e32-e33, 2009. Richard Carey-Smith et al. TruFit Polymer Scaffolds for the Management of Cartilage Defects of the Knee. Techniques in Knee Surgery. 8 (2): 136-141, June 2009. This advanced FDA-approved technology allows cartilage cells, know as chondrocytes, to be harvested from your knee and cultured and multiplied. The fresh chondrocytes are then re-implanted in your knee and cause hyaline-like cartilage to repair the defect in articulating surface. Our clinical experience with femoral, trochlear and patellar ACI surgery goes back to 1998. We have been using TiGenix ChondroCelect ACI (CCI) technology with Geistlich Chondro-Gide® membrane at Chester Knee Clinic, The Grosvenor Hospital Chester, since November 2004. 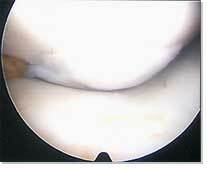 The first step (ACI Stage 1) is the harvesting of some healthy cartilage from you knee, which is done arthroscopically. This sample of cartilage is sent to special tissue-engineering laboratory, and it is used to grow new chondrocytes, which are sent back to us after 4 to 6 weeks. The second step (ACI Stage 2) is the re-implantation of the cultured chondrocytes. This procedure is done through an arthrotomy (open knee surgery). Basically, the surgeon debrides the cartilage defect down to the subchondral bone plate and prepares the recipient site. The defect area is covered with autologous periosteal or tissue-engineered bilayer collagen membrane (Chondro-Gide®), which is stitched in place and sealed with fibrin glue. The chondrocyte suspension is injected into this ”bioactive chamber”. The next step is final closure by suturing and applying fibrin adhesive. Within this chamber the cells will undergo re-differentiation and will be stimulated by growth factors to proliferate and to regenerate their specific cartilage matrix. The Chondro-Gide® is a CE-marked bilayer collagen matrix which has been especially designed for articular cartilage repair methods. The membrane consists of porcine-origin collagen Type I/III made by a unique, patented manufacturing procedure. The porous layer of the Chondro-Gide® matrix consists of collagen fibres in a loose, open weave arrangement that favours cell invasion and attachment, and encourages the redifferentation of chondrocytes, while the compact membrane layer with its smooth surface is cell occlusive. In accordance with EU and international guidelines strict measures are taken to ensure all membranes are completely free from viral or bacterial contamination. We prefer to use this membrane in ACI surgery, instead of autologous periosteum. ACI treatment is particularly suited for larger defects. Suitable patients would be generally young and healthy individuals, who have had an injury to the knee, and a so-called osteochondral lesion, over the past few months or years, and have continued to have pain, swelling and mechanical problems. This is a new procedure (in clinical use since 1987) and although it has been performed on over 30000 patients internationally, especially in Sweden and the USA, not every patient is suitable and not every patient achieves a completely satisfactory functional outcome. Source: Gina Brockenbrough, 1st on the web, ORTHO SuperSite, June 3, 2009. Autologous chondrocyte implantation (ACI) can provide high rates of patient satisfaction and maintain good outcomes at long-term follow-up, according to a Swedish study presented at the 8th World Congress of the International Cartilage Repair Society in Miami in May 2009. Vasiliadis HS, Concaro S, Brittberg M, et al. Autologous chondrocyte implantation: 10-20 years follow-up. Paper #15.3.1. Presented at the 8th World Congress of the ICRS. May 23-26, 2009, Miami. The occurrence of subsequent surgical procedures (SSPs), primarily arthroscopy, following ACI is common. For example, in the Study of the Treatment of Articular Repair (STAR), 49% of Carticel ACI patients underwent an SSP on the treated knee, during the 4-year follow up. The most common serious adverse events (up to 5% of patients), include arthrofibrosis and joint adhesions, graft overgrowth, chondromalacia or chondrosis, cartilage injury, graft complication, meniscal lesion, graft delamination, and osteoarthritis. Source: Carticel. A recent study from Germany, published in November 2008 issue of the American Journal of Sports Medicine, analyzed 349 ACI procedures of the knee joint. Three different ACI techniques were used. A major proportion of complications after ACI can be summarized by 4 major diagnoses: symptomatic hypertrophy, disturbed fusion, delamination, and graft failure. Among those, the overall complication rate and incidence of hypertrophy of the transplant were higher for periosteum-covered ACI. Furthermore, an increased rate of symptomatic hypertrophy was found for patellar defects. Source: Philipp Niemeyer, MD, et al. 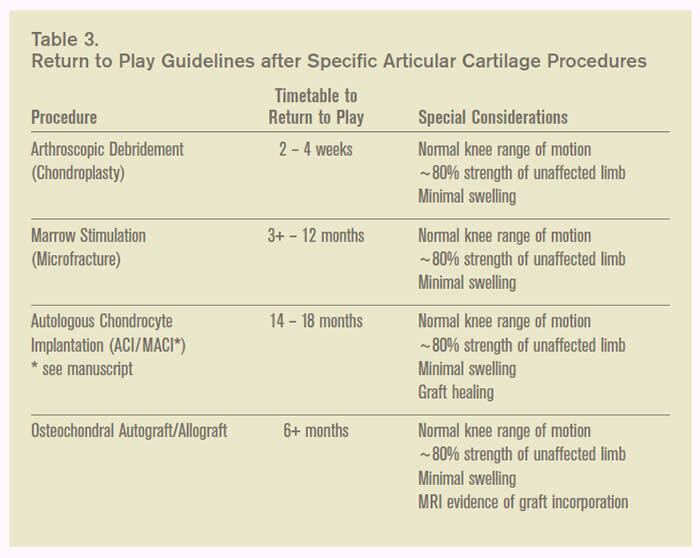 : Characteristic Complications After Autologous Chondrocyte Implantation for Cartilage Defects of the Knee Joint. The American Journal of Sports Medicine 36:2091-2099 (2008). NICE Recommendation: Autologous chondrocyte implantation (ACI) is recommended as an option for treating symptomatic articular cartilage defects of the knee, only if: the person has not had previous surgery to repair articular cartilage defects, there is minimal osteoarthritic damage to the knee (as assessed by clinicians experienced in investigating knee cartilage damage using a validated measure for knee osteoarthritis), the defect is over 2 cm2 and the procedure is done at a tertiary referral centre. BASK: "NICE to block use of proven knee articular cartilage repair technology"
However, this view is not supported by most UK orthopaedic surgeons who specialise in articular cartilage repair and use ACI technology in their practice. The BASK has issued the following statement to its members on 25 March 2015: "As discussed at the BASK Annual Spring Meeting last week, NICE has made an inappropriate provisional judgement on ACI that would deny us options for treating patients using therapies proven to work. The NICE judgement is for NHS patients, but insurers have stated they will not allow ACI either if it is termed experimental. Their provisional decision was based on insufficient review of the literature, misinterpretation of the literature and they ignored the commissioned independent advice group who deemed ACI to have a proven evidence base and to be economically viable. In fact, few of the treatments we use have a more solid evidence base and over 25 years in practice." The suggestions for further research are inappropriate and unethical. The NICE Committee was provided with the UK Cartilage Consensus Paper, which is in press. It is due to be published in April 2015. It had 72 signatures of clinicians involved in cartilage repair in the UK (including Prof Vladimir Bobic) at the time it was submitted to NICE. It now has close to 100, which represents the majority of orthopaedic surgeons who perform this surgery. The Dutch Orthopaedic Society and the German Orthopaedic Society have previously published similar papers. One of the reasons the UK Cartilage Consensus Meeting was convened, was due to the previous NICE Appraisal being cited by NHS and other health providers to deny patients access to treatments where the clinicians consider the evidence to be strong enough to recommend ACI in appropriate patients. Our response, which was communicated by email and at the BASK meeting was: "As we all know that has been going on for a long time and most NICE decisions about ACI were made without any input of people who have any experience in cartilage repair. More importantly NICE has always insisted on clinical trials where ACI is compared with microfracture or that ACI can be done only after failed microfracture. We know what happens when ACI is done after failed microfracture, from Tom Minas paper from 2009 on various problems like formation of intralesional osteoohytes, etc. So NICE is indirectly responsible for probably quite a few failed ACIs, because surgeons were advised to do microfracture first, or to do ACI only if microfracture fails. Insurance companies are using NICE NHS guidance as an excuse not to fund ACI surgery, and a few other "unproven" or "experimental" technologies so it is very likely that this situation is slow beginning of the end of ACI surgery in the UK." T. Minas: Autologous Chondrocyte Implantation for Chondral Defects of the Knee. Department of Orthopaedic Surgery and Cartilage Repair Center, Brigham & Women's Hospital, Boston, Massachusetts, USA. Cartilage Repair Center, Chestnut Hill, MA, USA: www.cartilagerepaircenter.org. Randall R. Wroble: Articular Cartilage Injury and Autologous Chondrocyte Implantation - Which Patients Might Benefit? The physician and sportsmedicine, November 2000. K. Hambly, V. Bobic, B. Wondrasch, D. Van Assche, and S. Marlovits. Autologous Chondrocyte Implantation Postoperative Care and Rehabilitation: Science and Practice. The American Journal of Sports Medicine 34:1020-1038 (2006). Wasiak J, et al. 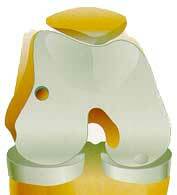 : Autologous cartilage implantation for full thickness articular cartilage defects of the knee. The Cochrane Database of Systematic Reviews 2008, Issue 3. For long term outcomes of Carticel ACI surgery please see: Large Outcome Studies Reported at AAOS Annual Meeting Support Longterm Clinical Duration. Genzyme, March 10, 2008. Brian J. Cole: A Randomized Trial Comparing Autologous Chondrocyte Implantation with Microfracture. Letter to the editor. The Journal of Bone and Joint Surgery (American). 2008;90:1165. The Economist, Science & Technology. Cell therapy: No knee-jerk reaction. An innovative way to fix knees appears to provide lasting benefits. From The Economist print edition, New York, March 13, 2008. Kenneth Zaslav et al. A Prospective Study of Autologous Chondrocyte Implantation in Patients With Failed Prior Treatment for Articular Cartilage Defect of the Knee. The American Journal of Sports Medicine January 2009 37:42-55. To get maximum benefit from ACI surgery, you should adhere to specific rehabilitation programme. This may include weight-bearing restrictions, limited range of motion, and numerous muscle strengthening exercises which will progress very slowly initially. However, when you successfully complete your rehabilitation, you should be able to resume normal activities, including most sports. Tom Minas et al. Increased Failure Rate of Autologous Chondrocyte Implantation After Previous Treatment With Marrow Stimulation Techniques. Am J Sports Med May 2009 37:902-908. Article Conclusion: "Defects that had prior treatment affecting the subchondral bone failed at a rate 3 times that of nontreated defects. The data demonstrate that marrow stimulation techniques have a strong negative effect on subsequent cartilage repair with autologous chondrocyte implantation and therefore should be used judiciously in larger cartilage defects that could require future treatment with autologous chondrocyte implantation." Only one multicenter study to date has researched return to sport after ACI: Mithöfer and coauthors studied the ability of 45 soccer players to return to soccer in a 40-month (±4 months) follow-up period after ACI. They found that despite 72% of players reporting good to excellent knee function, only 33% were able to return to soccer. What is unclear is whether the two thirds of players who did not return to soccer were clinically unable to return to play or whether they either chose to switch to a lower-impact activity or opted not to return to sport at all. The definition of “ability to return to sport” and the relevance of current outcome measures to sporting participation require further exploration and clarification. Younger age and shorter preoperative duration of symptoms were also shown to significantly improve the ability to return to soccer. However, this improved potential to return to soccer could well be due to a greater influence of psychosocial factors and changing life priorities rather than to physiological properties such as healing and chondrocyte maturation. MRI imaging is frequently advised prior to clearance to assess graft integration and subchondral activity. Source (including the table above)*: Jesu Jacob and Albert W Pearsall IV: In-season treatment of articular cartilage lesions of the knee. AOSSM Sports Medicine Update, May/June 2009, 2-6. Source **: Karen Hambly et al. Clinical Sports Medicine Update: Autologous Chondrocyte Implantation Postoperative Care and Rehabilitation. The American Journal of Sports Medicine June 2006 34:1020-1038. Kai Mithöfer et al. Functional Outcome of Knee Articular Cartilage Repair in Adolescent Athletes. The American Journal of Sports Medicine August 2005 33:1147-1153. Mithoefer K, Peterson L, Mandelbaum B, Minas T. Articular cartilage repair in soccer players with autologous chondrocyte transplantation: functional outcome and return to competition. Am J Sports Med, November 2005; 33: 1639 – 1646. http://ajs.sagepub.com. Kai Mithoefer, Karen Hambly, Stefano Della Villa, Holly Silvers, and Bert R. Mandelbaum. Return to Sports Participation After Articular Cartilage Repair in the Knee: Scientific Evidence. Am J Sports Med November 2009 37 167S-176S. Kai Mithoefer, Karen Hambly, David S. Logerstedt, Margherita Ricci, Holly Silvers, Stefano Della Villa. Current Concepts for Rehabilitation and Return to Sport After Knee Articular Cartilage Repair in the Athlete. J Orthop Sports Phys Ther 2012; 42 (3): 254-273. This femoral condyle partial resurfacing device is made from a microcomposite of Hyaluronic Acid and UHMWPE. This product is now available for use in the UK under the terms of the clinical trial (multi-center, open label, prospective, consecutive series registry database of BioPoly™ RS partial resurfacing knee implant clinical trial, approved by the NHS NRES Cambridge Central on 14 September 2011). We are now recruiting patients for this clinical trial (please see a list of Inclusion and Exclusion Criteria). Please be aware that we can not enter any potential candidates into the BioPoly clinical trial before they have been seen and examined in person at one of the sites by one of the investigators listed below. Email and telephone communication, however specific or detailed, are not sufficient for entry to this clinical trial. Although the manufacturer of BioPoly implants will provide all implants free of charge for the duration of the clinical trial, your medical insurer or you will be responsible for all other costs (clinic appointments, imaging such as X-ray or MRI, the costs of the surgical procedure and hospital charges as well as peri-operative physiotherapy). This does not apply if you enter the BioPoly clinical trial as an NHS patient. Riley J Williams III, Ed. Cartilage Repair Strategies. Humana Press, Totowa, New Jersey 2007. J. Winslow Alford and Brian J. Cole. Cartilage Restoration, Part 1: Basic Science, Historical Perspective, Patient Evaluation, and Treatment Options. The American Journal of Sports Medicine 2005; 33:295-306. J. Winslow Alford and Brian J. Cole. Cartilage Restoration, Part 2: Techniques, Outcomes, and Future Directions. The American Journal of Sports Medicine 2005; 33:443-460. Vladimir Bobic. Current Status of the Articular Cartilage Repair. e-biomed: The Journal of Regenerative Medicine. April 13, 2000. Bert R. Mandelbaum et al. Articular Cartilage Lesions of the Knee. The American Journal of Sports Medicine, November 1998 26:853-861. Disclaimer: This website is a source of information and education resource for health professionals and individuals with knee problems. Neither Chester Knee Clinic nor Vladimir Bobic make any warranties or guarantees that the information contained herein is accurate or complete, and are not responsible for any errors or omissions therein, or for the results obtained from the use of such information. Users of this information are encouraged to confirm the accuracy and applicability thereof with other sources. Not all knee conditions and treatment modalities are described on this website. The opinions and methods of diagnosis and treatment change inevitably and rapidly as new information becomes available, and therefore the information in this website does not necessarily represent the most current thoughts or methods. The content of this website is provided for information only and is not intended to be used for diagnosis or treatment or as a substitute for consultation with your own doctor or a specialist. Email addresses supplied are provided for basic enquiries and should not be used for urgent or emergency requests, treatment of any knee injuries or conditions or to transmit confidential or medical information. If you have sustained a knee injury or have a medical condition, you should promptly seek appropriate medical advice from your local doctor. Any opinions or information, unless otherwise stated, are those of Vladimir Bobic, and in no way claim to represent the views of any other medical professionals or institutions, including Nuffield Health and Spire Hospitals. Chester Knee Clinic will not be liable for any direct, indirect, consequential, special, exemplary, or other damages, loss or injury to persons which may occur by the user's reliance on any statements, information or advice contained in this website. Chester Knee Clinic is not responsible for the content of external websites.